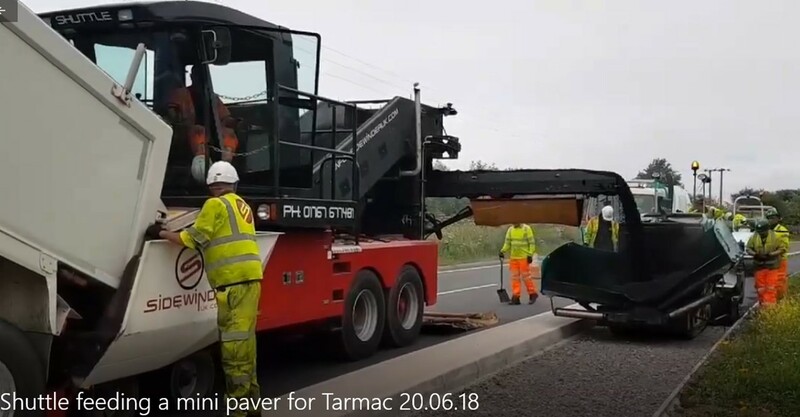 About 6 weeks ago in mid June the Shuttle went to the A403 Severn Road near Severn Beach, South Gloucestershire for Tarmac Contracting. The task was to feed a mini-paver surfacing 1000 metres of fully reconstructed footpath at 2.0 metres wide and 75mm thick. 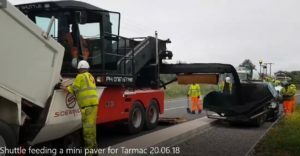 Tarmac were using the scheme to promote their own product Ultifastpath the recent innovation in asphalt for footpath construction allowing the surfacing to be carried out in a single layer without detriment to the integrity of the finished product. Over 2 days the Shuttle fed approximately 380.00 tonnes to the mini-paver at an average discharge of under 16 minutes per 20.00 tonne load. To see other examples of how Sidewinder can improve the efficiency of your project, go to our Case Studies page here.